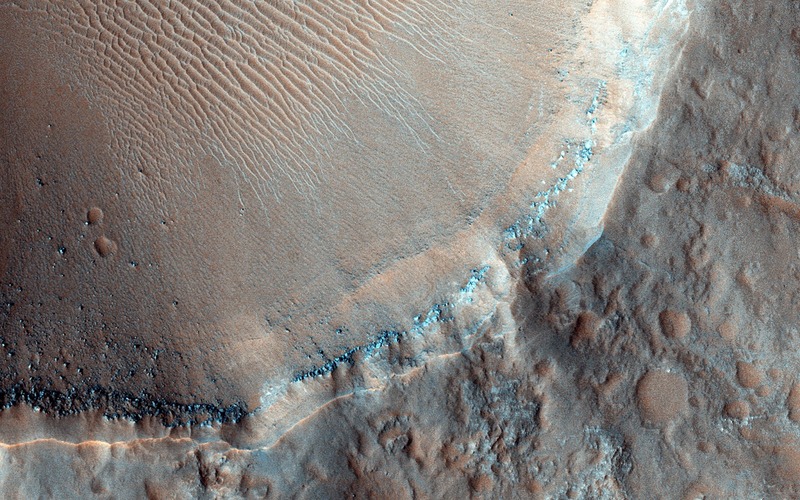 This region, comprised of jumbled blocks of flat-topped hills, is known as chaotic terrain. These channels, which emerge from the chaotic region, are separated by elongated hills that coalesce into a single channel before disappearing into the Margaritifer Chaos to the north. Chaotic terrains are thought to be the regions where ground water erupted catastrophically onto the surface, forming highly erosive flows that carved the outflow channels. The hills just downstream of the chaotic source region were shaped into streamlined islands by the erosive flows, forming blunt rounded ends in the upstream direction and tapering towards the north in the downstream direction. 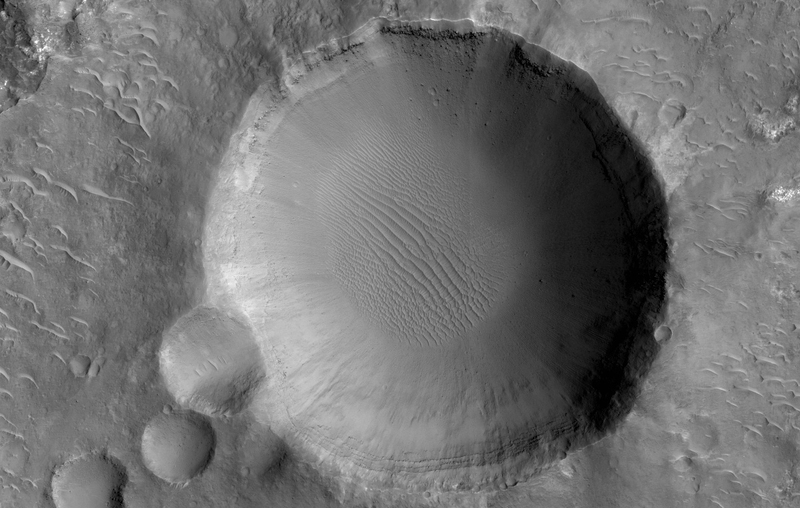 Although windblown sediments now cover the original flood-carved channel floor in a sea of dunes, a 1.5 kilometer diameter impact crater provides a window into the sediment on the channel floor. The crater exposes several layers along its upper walls including a distinct bouldery layer just below the mantle of windblown sediments. These boulders may have originated from the eruption site and were transported and emplaced on the channel floor by high energy floods. Alternatively, these bouldery layers may be lava that subsequently flowed across the flood scarred channel floors. Note: For more information, see PIA19116: Seeing Beneath the Surface in Morava Valles.